Gravity-defying puzzler releasing next year. I think we have found the antithesis to a Call of Duty trailer: a slow-moving, explosion-free video showing off some lovely architecture, accompanied by a beautiful piano piece. Here's the first 'architecture teaser' for Manifold Garden, a physics-defying puzzle game I was very excited about last year. Back then, I said that Manifold Garden would probably be done in 2016, but it turns out I was a filthy liar. The new estimate, on the newly minted Steam page, is "2017", with the game inaccurately described as "coming soon". 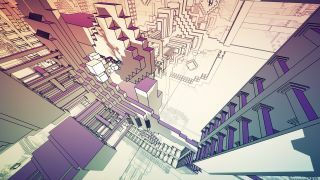 Manifold Garden fuses Escher-esque architecture with mind-boggling puzzles, and I'm reminded pretty strongly of Antichamber. We still don't know much about the game, but if you're looking to be more illuminated before going in, creator William Chyr regularly streams its development over on Twitch.